Contemporary home décor and unique showpieces go hand in hand. 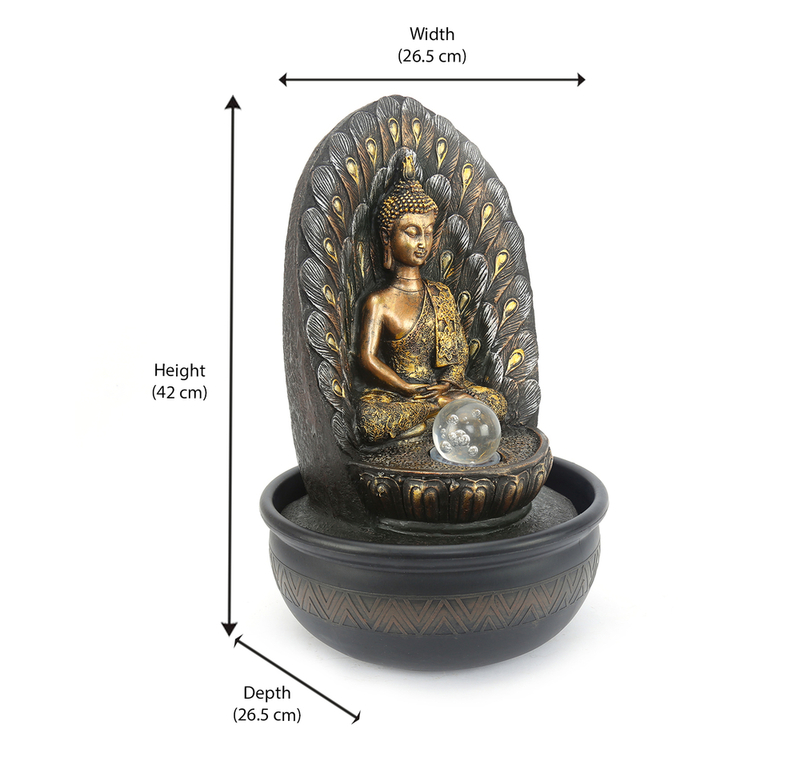 This Buddha Peacock water fountain is a fine specimen of what goes perfectly with modern interiors. The idol of Lord Buddha sits in his trademark meditating pose with a calm and peaceful expression on his face on a platform of lotus. The cascading throne of peacock feathers behind him looks like a halo and adds a majestic feel to the piece. The bowl on which the idol sits acts like an indoor fountain and the bright LED bulb in front multiplies the overall charm of the piece manifold times. The material used in making the water fountain is premium quality polyresin, which is weather resistant and thus makes sure the product does not succumb to the constant use of water. The whole piece is undoubtedly a great addition to your home décor. The combination of sparkling water highlighted with LED lights is in itself very pleasant. Add to that the calming presence of Lord Buddha in gold and the peacock feathers – and the whole showpiece becomes the centre of attraction. Add such easy-maintenance, lovely items for decorating your home from @Home and bring a sense of completeness to your home décor.